Benshiva welcomed "Spook" early 2006. 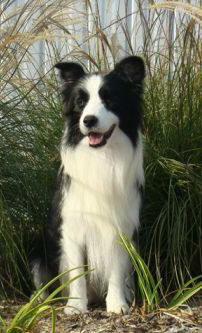 Spook is owned in partnership with Nahrof Border Collies and we thank Lauren and Errol very much for their generosity in allowing him to be campaigned by us. 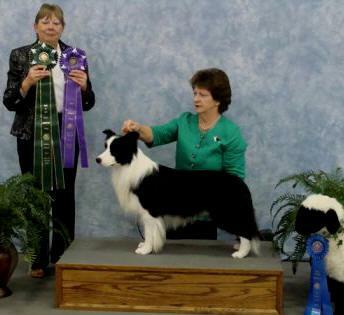 He had a great show career whilst with Lauren, a highlight of his was placing third in the Puppy Dog class at the Border Collie Nationals in April shortly before arriving to our home. He has gone on from his early promise to win multi Best Of Breeds, Challenges, Classes In Group and Show and is a consistent performer at specialties. 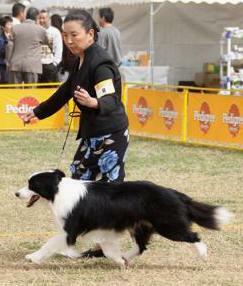 He has won many Reserve Challenge at some of our major shows as well. We believe this young dog has a very bright future ahead of him. Spook is currently in Japan with our good friends Yuriko and Tatsuki Oneyama of the highly successful Borderlane Kennels and he has done very well for them. In 2010 he travelled to the USA to compete in the Nationals and with Lauren on the end of the lead they walked away with Winners Dog and Award of Merit!! He has matured into a stunning dog indeed.